That’s the funny thing about the recent swoon in mortgage applications. It’s happened even with record low rates (which were designed to spur spending). And now rates are starting to tick up. The sharp drop in 2010 mortgage volume to $1.314bb (roughly 8.75mm loans) from $1.9bb in 2009 recently forecast by Fannie can’t be minimalized. Especially considering rates are at historically low levels and the GSE’s have a long history of over-estimating loan production and revising down later. With this revision, Fannie’s estimate has moved closer to my estimate and a recent one from iEmergent of $1.1 trillion, a 42% drop from 2009 levels and a pace not seen since the turn of the century. 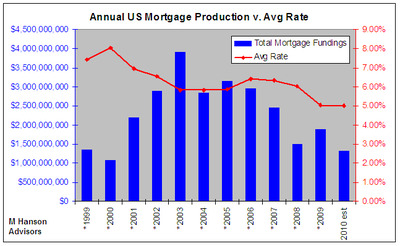 2010 volume is even projected to be lower than 2008, one the worst year on record for mortgage production (based upon how many are outstanding), when rates were 100-150bps higher, values were still plummeting, lenders were collapsing daily, and exotic loans were all but gone from the marketplace (except Wachovia Pay Options). If this is not what a double-dip chart looks like (2008 – 2010) I don’t know what does. It highlights what is not only wrong with the mortgage credit market, but everything mortgage, housing and household balance-sheet related. This market has no precedent and they expect traditional housing market ‘fixes’ — most notably sparking demand but this time around controlling distressed supply as well — to have an effect on this monster. 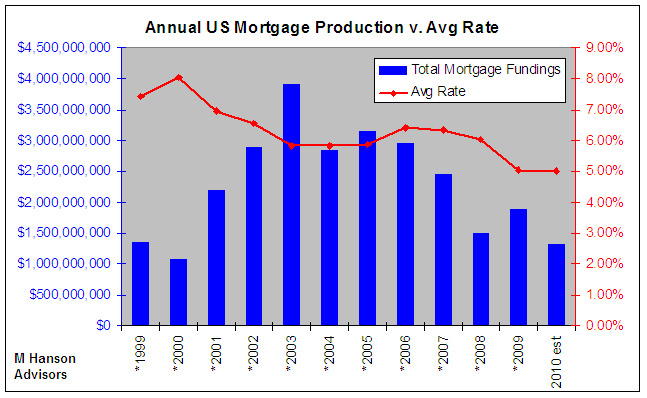 When rates drop refi loan volume is supposed to rise. This is because far more people own homes than buy each year. In 2009, this happened primarily because there were years of pent-up demand for fixed rates below 5.5%. And when Fed QE forced rates down swiftly in Q1 2009, everybody who could refi did it quickly thinking the low rate environment was fleeting because that is the way Fed QE was billed. But the pulled forward demand leaves little left over for 2010 and exposes just how weak the base of current homeowners really are with respect to borrowing ability. The fact is many can’t or won’t borrow without exotic loans because they are too leveraged, lost their job, have too weak of credit based upon new-vintage guidelines, can’t purchase a new home better than the one they live in now, or for a variety of other reasons. Many simply don’t want to refi into a fixed rate loan because their present exotic loan obtained during the bubble offers low payments not available with a 5% fixed rate today…a 5% 30-year fixed rate refi would bring a payment increase!